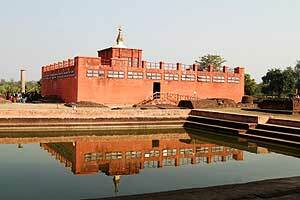 Lumbini, Nepal -- Lumbini is said to be the location of the birthplace of Buddha, which is located in present day Nepal. The importance of Lumbini is not only marking the region where Siddhartha was born but with his birth it is also where Buddhism itself was born. However, the site has fallen into disarray and ruin, unlike it's more famous pilgrimage site of Bodh Gaya where Buddha was said to have awoken from delusion and realized full enlightenment. In recognition of its religious significance, the United Nations Educational, Scientific and Cultural Organization (UNESCO) designated Lumbini as a World Heritage Site in 1997. Today, environmental pollution from heavy industry (cement and steel plants) that have located in the Lumbini region of Nepal is degrading air and ground water quality and local agriculture. It is likely impacting human health as well. A campaign has been underway for some years now to stop this desecration of Lumbini's sacred space. As the collective voice of Lumbini's friends around the world, LEPA [Lumbini Environmental Protection Alliance] is writing to request support in an international effort to protect and safeguard Nepal's Lumbini from the growing impacts of environmental pollution. strictly monitor existing industrial firms. The document requests that the Ministry of Environment of the Government of Nepal undertake a continuous, professional industrial pollution monitoring and assessment program of the industries and environment in the Lumbini Road Industrial Corridor, with certain provisions as noted therein. 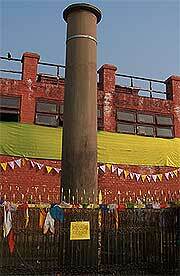 Air polluting substances (particulate matter, carbon dioxide, nitrogen oxides and other pollutants) emitted by the factories in Gonaha VDC 6 – 8 and Kamhariya 3 - 6 are likely to damage the Lumbini Ashoka pillar with its inscription and the archaeological remains at the World Heritage Site Lumbini and other archaeological sites. Historic stone structures in Europe, notably the Cathedral of Seville, Spain, have been damaged by air pollution in a manner similar to what is occurring at the ruins of the great Maya cities in Mesoamerica. This is what will be expected to occur in Lumbini in the near and middle term if the status quo remains. We are writing to enlist your support in an international petition to protect the environment of Lumbini, the Birthplace of the Buddha, from degradation caused by heavy industry that has located in the Lumbini region of Nepal. The environmental pollution caused by cement and steel plants in this area is degrading local ground water and air quality and has already impacted local agriculture and public health. Needless to say, it is also impacting Lumbini's sacred space. The Industrial Promotion Board (IPB) of Nepal's Ministry of Industry issued 4 decisions in late November 2009 to restrict industrial activities in the area. However, no action has followed and the situation continues to deteriorate. A local, national, and international initiative has been launched to protect Lumbini's sacred environment and the health of its community. This initiative is now led by the Lumbini Environment Protection Alliance (LEPA), an international alliance that includes the Lumbini Development Trust (established by the government of Nepal to oversee this World Heritage Site), Lumbini Institutions (all the Buddhist monasteries in Lumbini), and the Lumbini Stakeholder Committee, comprising numerous Buddhist and non-Buddhist organizations as well as individual supporters from around the world. The full petition prepared by LEPA with complete background information is viewable at <http://tinyurl.com/yalhvkj>. The petition to be signed and submitted by individuals can be found at the following address: <https://spreadsheets.google.com/viewform?formkey=dF8xYzkteHFmNi1jTFA2R3J4a28zRWc6MA>. We are writing today to plead for your support in this international effort. If you would add your name to this petition, it would add immeasurably to the significance and value of this initiative to restore the integrity of Lumbini's sacred space for current and future generations of humanity.